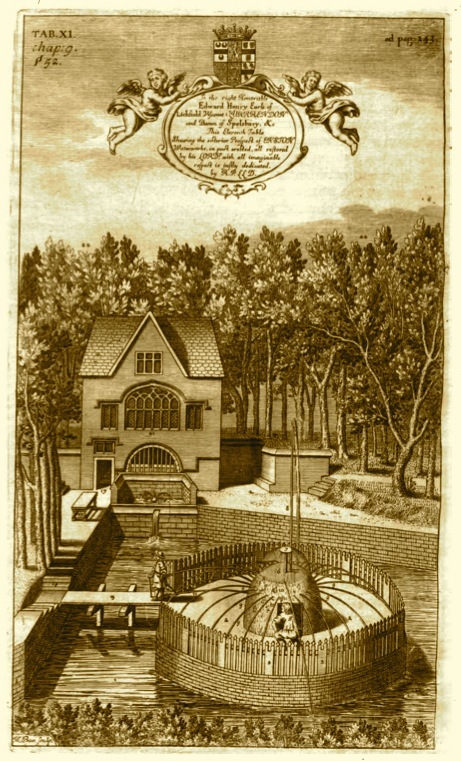 The village of Enstone, some 20 kilometres north–west of Oxford was home to one of the most extraordinary collections of water powered special effects or giochi d’aqua as they are termed in Italian, known collectively as the ‘Enstone Marvels’. Completed in 1636 by Thomas Bushell they became known as one of the wonders of the age and were subject to a well-documented visit by King Charles I and his queen Henrietta Maria in that same year. Their fame was enshrined in Robert Plot’s Natural History of Oxfordshire of 1677 which not only had detailed descriptions of the site but also two memorably detailed engravings. Widely illustrated in most books on garden history it has been assumed that the actual site of the Marvels would have little to show given that they were comprehensively demolished in 1846. 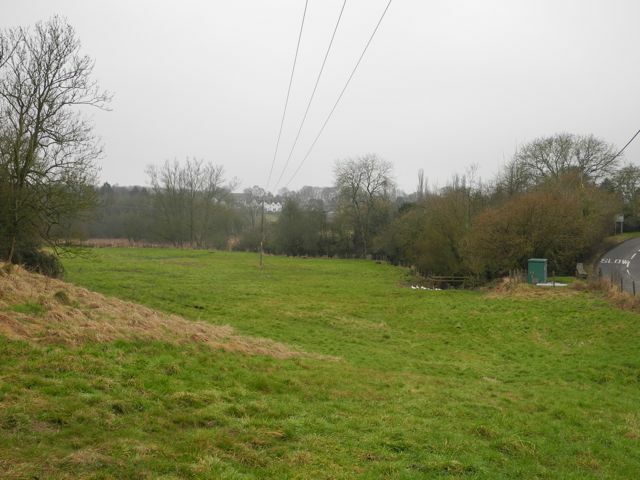 A preliminary visit in March 2013 has shown that while this may have been the case there is still plenty of material around that, subject to archaeological investigation can reveal more of the nature of this remarkable site. Enstone, on Stoney Bridge looking south towards the River Glyme. The Marvels were behind the trees, centre right. The general location of the Marvels has never been entirely lost. 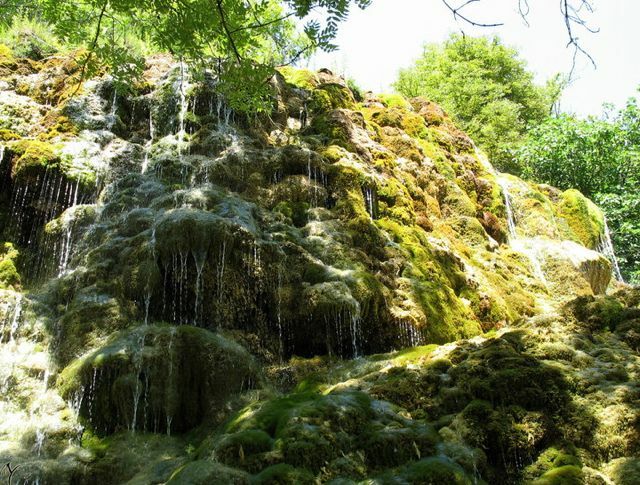 They stood on the northern side of a broad steep sided valley cut in the underlying Chipping Norton Oolitic limestone by the eastward flowing River Glyme. 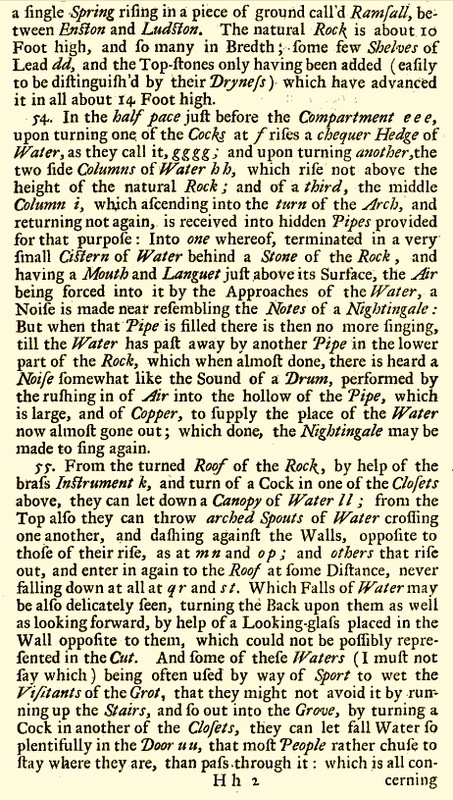 Plot tells us that a natural spring known as the Goldwell was being cleared on the orders of Bushell when it became clear that he had accessed something of a natural phenomenon, in particular a ‘petrifying well’ a source of water high in Calcium which is so ordered that dripping water rapidly coats nearby objects in a layer of calcite. It is unclear whether Bushell’s intention in settling here was from the outset to create something special or whether it really just a happen chance that Bushell decided to capitalize on. What is obvious is that even today at least half a dozen springs bubble up out of the ground here. Le Jardin des Fontaines Pétrifiantes near Grenoble in France, could this resemble something Bushell discovered when he cleared the undergrowth? As he is the pivotal figure in the story of the Enstone Marvels it is worth considering in outline the career of their originator Thomas Bushell. The information that follows is taken from the on-line version of the Dictionary of National Biography. There is a more detailed account of his life penned in 1932 by J.W. Gough but I have not yet been able to track down a copy. Bushell was born some time before 1600 to a family of minor gentry from Cleeve Prior near Evesham. 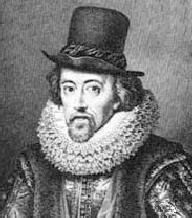 He had a chequered childhood with little education and a certain amount of wayward behaviour before, at the age of 15, entering the service of Sir Francis Bacon. Bacon was one of the foremost natural philosophers of the day and his interest in scientific method and technology must have done much to form Bushell’s view of the world. Bacon clearly took to the young Bushell and began to remedy some of the defects in his education. They shared an interest in current technologies and became concerned in the refinement of certain techniques for draining and ventilating mines. After Bacon’s fall from grace in 1621 Bushell took himself off, in the face of allegations of corruption, to the Isle of Wight and then the Calf of Man where he claimed to have lived the life of a hermit subsisting on herbs and whatever else grew nearby for three years. He was able to return to Bacon’s service in the final years of his life and when his mentor died in 1626 Bushell was set up with a marriage to an heiress and was able to take on the small estate in Enstone the same year. 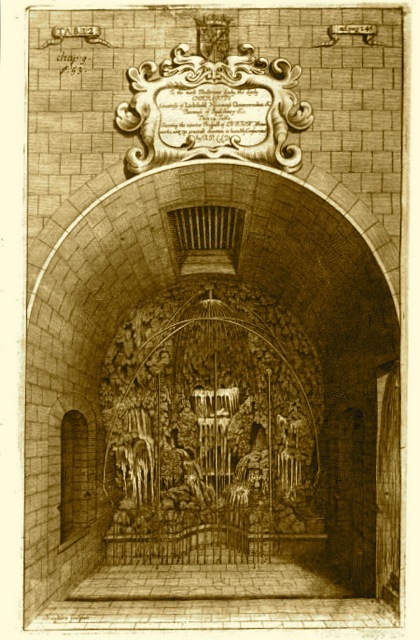 He then spent the next decade in improving the property including building the grotto and attached banqueting house, which even at the time astonished his contemporaries with its extravagance given that he only had leasehold on the property. One Lieutenant Hammond who visited in 1635 remarked that it was all ‘a mad gim-cracke sure’. All this lead up to the royal visit of 1636 when Bushell was able to make a pitch to Charles I for the opportunity to take over the royal silver mines in Wales. Is it too cynical to suggest that attracting this kind of royal patronage was part of his motivation for creating the Marvels in the first place? Bushell’s ambitious proposals for the mine workings were clearly not costed and he rapidly ran up huge debts. He was obviously an accomplished salesman for as Aubrey says in his Brief Lives, ‘his tongue was a chaine and drew in so many to be bound for him and to be ingaged in his designes that he ruined a number’. Nevertheless in 1637 the crown issued letters patent to enable him to set up a mint in Aberystwyth. 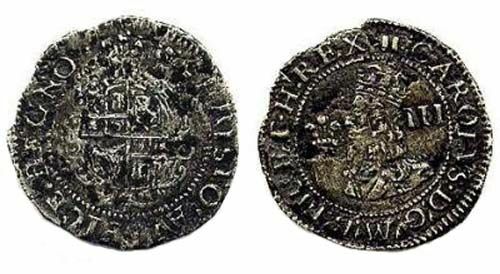 At the outbreak of the Civil War the mint was moved to Shrewsbury and in 1643 Bushell and his coining operation followed the king to Oxford. 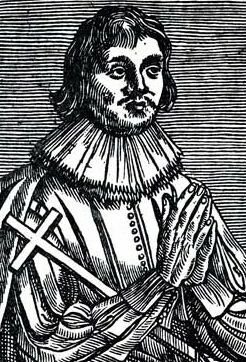 From there he was sent to Bristol and ended the war as commander of the garrison on Lundy, only surrendering to Parliament in July 1646. He tried to float a variety of new mining ventures in the west country during the years of the Commonwealth and like many Royalists was disappointed by the lack of success he had in trying to press his claims for financial compensation with the newly restored Charles II. All this lead to his final years being ones of perpetual debt and occasional imprisonment. Finally in 1633 he was granted a position of ‘gentleman of the privy chamber extraordinary’ which gave him some measure of protection. He died in 1674 and was buried in the cloisters of Westminster Abbey. We have little information about Bushell's relationship with Enstone during the Civil War years and afterwards except to note that according to Plot the works had fallen into disrepair and things were not put right until 1674 when presumably upon Bushell’s death the lease reverted to the landowner the newly promoted 11 year old Earl of Lichfield. Sir Edward Lee, the fifth baronet Quarrendon was created earl by Charles II on the occasion of the boy’s betrothal to the King’s illegitimate daughter Charlotte Fitzroy. 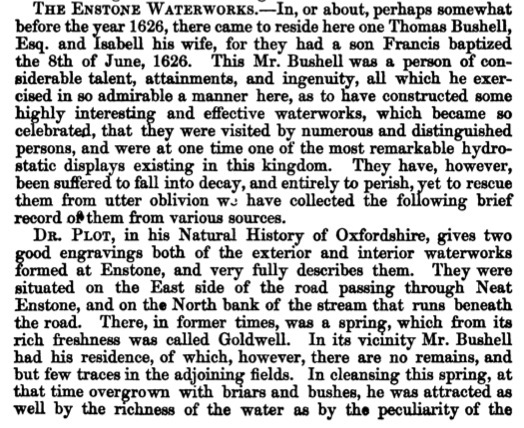 Although Bushell was clearly the originator of the Enstone Marvels some of the more remarkable features were added by the Earl of Lichfield which of course poses a number of questions. Given his tender years one wanders on whose advice the decision was taken not only to restore but also extend the Marvels. Was this by way of acknowledging and celebrating the arrival of a new earl by means of a high profile building project which demonstrated how much in touch he was with current technological wonders? It has to be said, however, that by the time of Plot’s visit in the 1670s such things were already looking slightly old-fashioned, perhaps the young earl had not been particularly well advised. We need to look closely at Robert Plot’s account of his visit for it is one of the most exhaustive descriptions we have of a seventeenth century wonder and together with the detailed engravings presents us with an unparalleled picture of such effects. Plot, born in 1640, was an Oxford scholar who began work on his Natural History of Oxfordshire in June of 1674 completing it three years later. 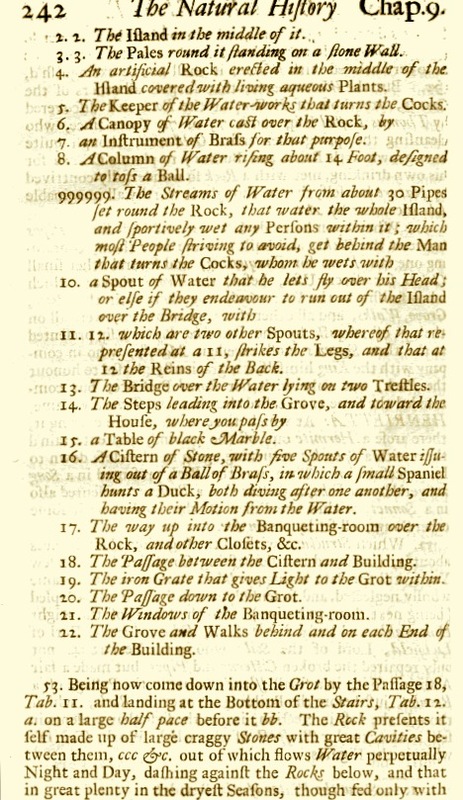 Such a full account particularly as far as the ‘nuts and bolts’ of the Marvels are concerned are invaluable, especially when we come to reconstructing the arrangements for the House of Diversion at Hanwell. 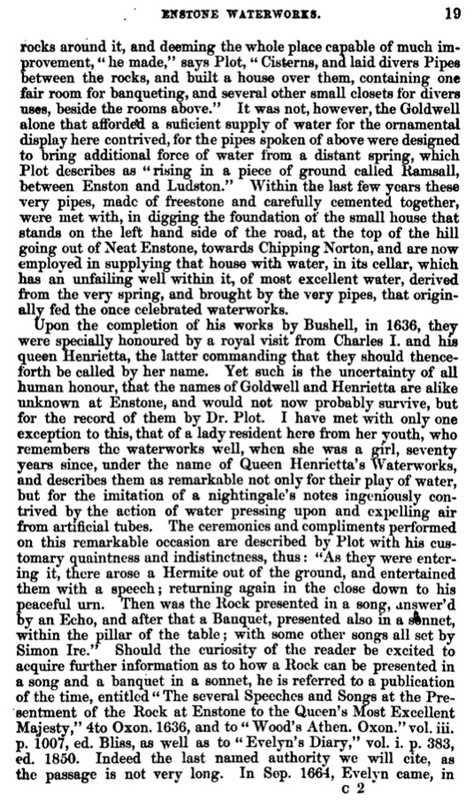 There is one curious error, Plot says that the spring was discovered by Bushell ’73 or 74 years since’ which is odd because this would make Bushell active on site at the age of 5 or 6 over 20 years before he leased the property! 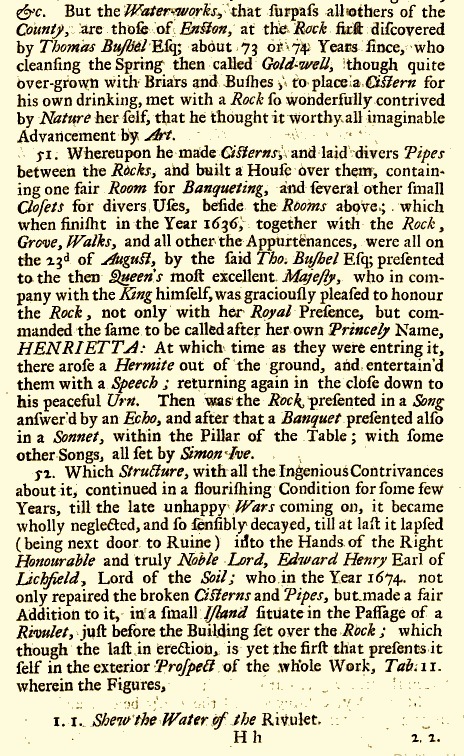 We also have a publication; The Several Speeches and Songs at the Presentment of the Rock at Enstone to the Queens Most Excellent Majesty which details the celebrations which quite typically greeted their majesties Charles and Henrietta, a performance which included a hermit arising from the depths, a playing no doubt of the special effects and sundry sonnets and songs set by one Simon Ive. 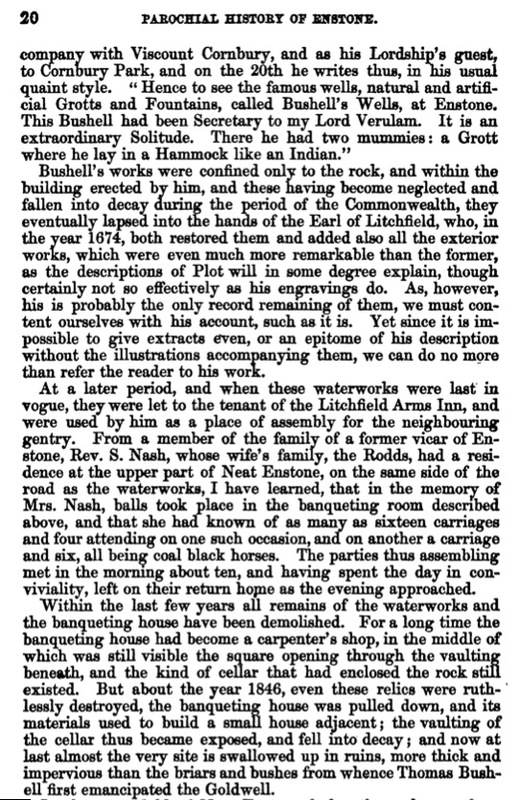 We are even more fortunate in having from1857 the extraordinarily detailed 465 page and exhaustively titled: Parochial history of Enstone, in the county of Oxford: being an attempt to exemplify the compilation of parochial histories from antiquarian remains, ecclesiastical structures and monuments, ancient and modern documents, manorial records ... &c., &c by the Reverend John Jordan. It is worth reproducing the full text of his comments on the Marvels as it gives a remarkable and unusually full account of the monument’s latter days and ultimate demolition. So much for the literary and historical background, what is there to see on the ground today and beyond that what may be revealed by further archaeological study? 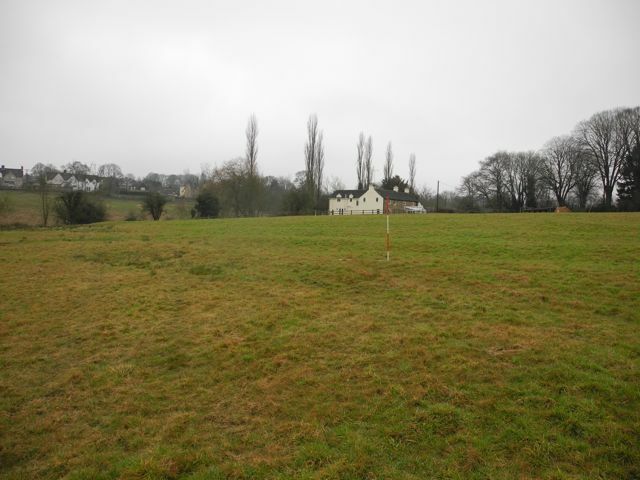 The property described by Jordan as being built from the remains of the banqueting house remains on site to this day and is part of a house known as the Wells. As this was built ‘adjacent’ to the ruins one might expect the location to be close by although presumably not so close as to run the risk of subsidence into the subterranean grotto which was still in existence. 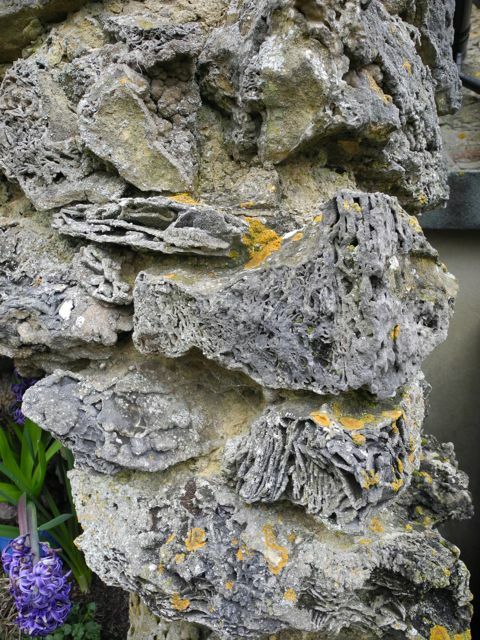 One must assume that during the course of demolition useful stone would have been carted away as would any surviving pipes and other fittings and the grotto itself filled in with loose rubble and other less usable materials on site. 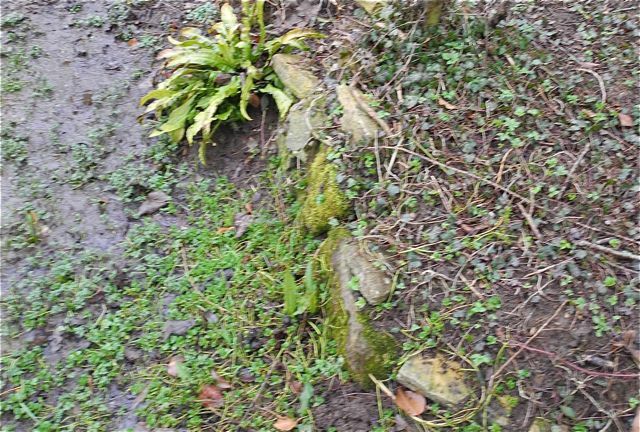 It is questionable what else was removed from the grotto and it is possible that some of the decorative material was reused elsewhere (see below), however, it seems likely that structurally the grotto still could survive substantially intact below ground and that the material used to fill it would tell us much about the superstructure that Plot illustrated. So where was it? 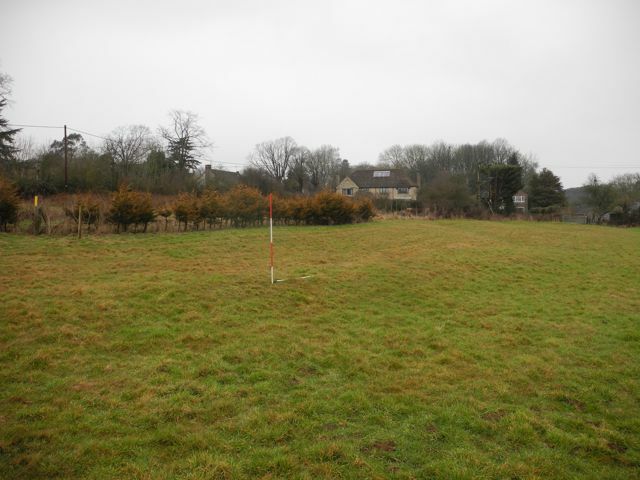 There has been some additional development around the site and the current landowner has observed that no structural remains were found during related ground works so this narrows down the areas under consideration. The other factor which must be taken into account in locating the site of the grotto is the local topography as illustrated by Plot. 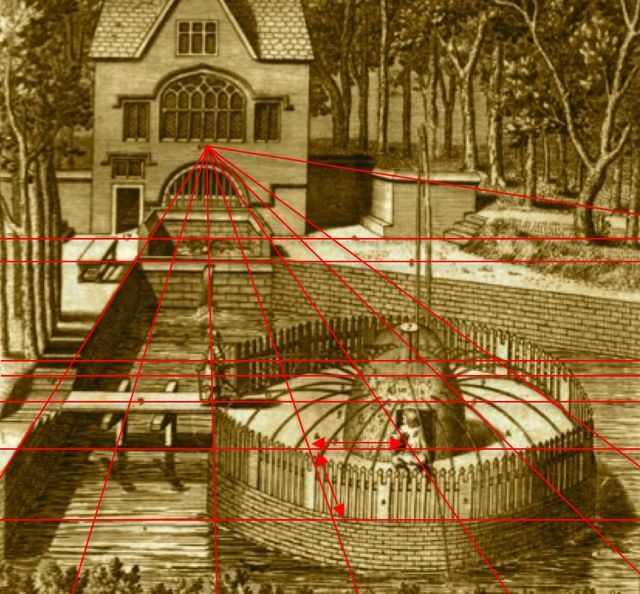 This shows the way in which the building is terraced back into the valley side and how it relates to the level of the water in the adjacent pond. On the admittedly big assumption that Plot’s picture is reasonably accurate and given the number of visual clues to scale we can convert this drawing into an admittedly speculative plan. 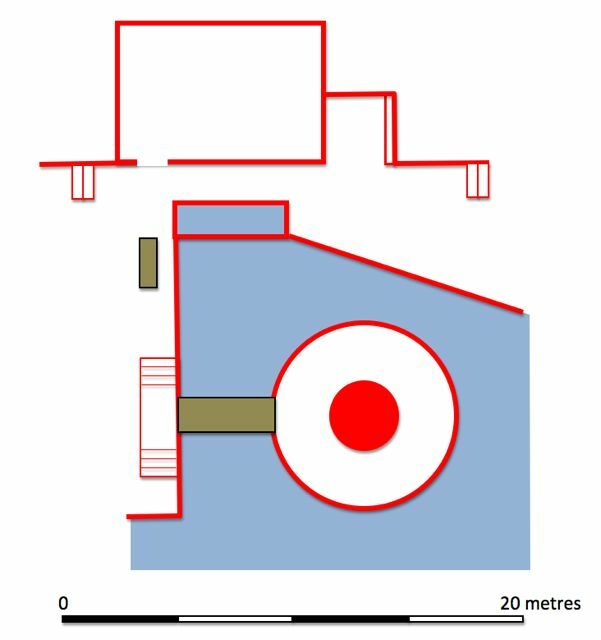 In the foreground perspective 2 metre squares are overlaid on the plan, this data and other measures such as the likely length of the table and the width of the door have been used in the plan. The small cistern in the garden of the Wells, view from south-east. 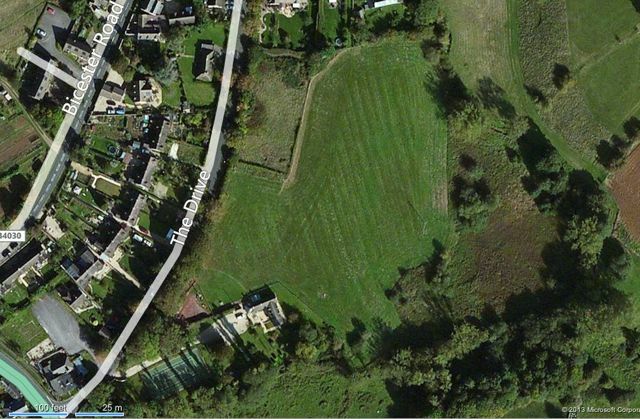 If we now transfer the plan to an aerial view of the site we can begin see what options best fit the current topography. 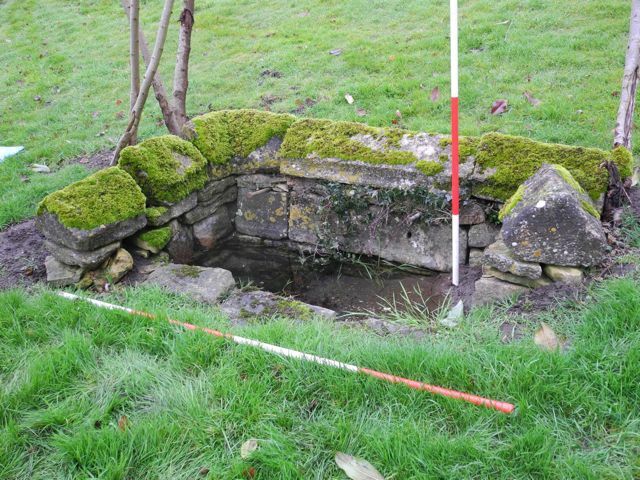 One important additional feature is that in the garden of the property is a small enclosed tank containing a spring and edged with stone coping very similar to that shown around the 'spaniel and duck' cistern. Could this be that cistern still amazingly preserved in position? Well it seems unlikely, the size is wrong, the construction rough and the location seems too high above current water levels. Nevertheless it could be a feature reconstructed roughly in place as a memento of the now vanished structure. Whatever the case the plan can be dropped into place in roughly the same location to give us a starting point for further debate about the exact position. 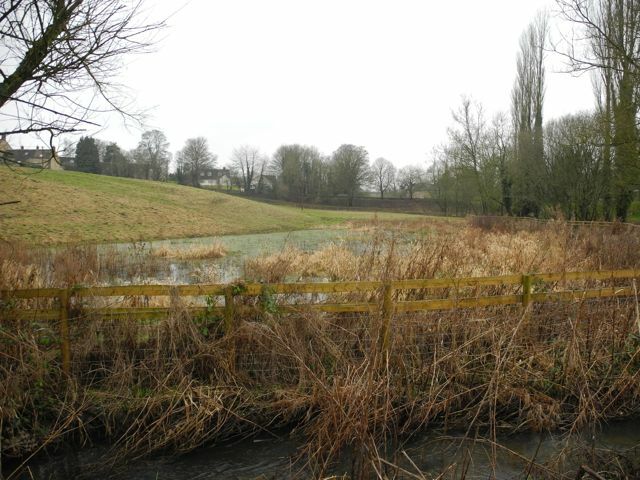 There is a large open area to the south of the river which is currently flooded and may have formed part of a larger pool associated with the works but this exercise does demonstrate that the whole thing could have been fitted in north of the current river course. If we relocate the site further to the west it overlaps with an existing pond which may reflect part of the original and a round picnic table would lie close to the site of the island! 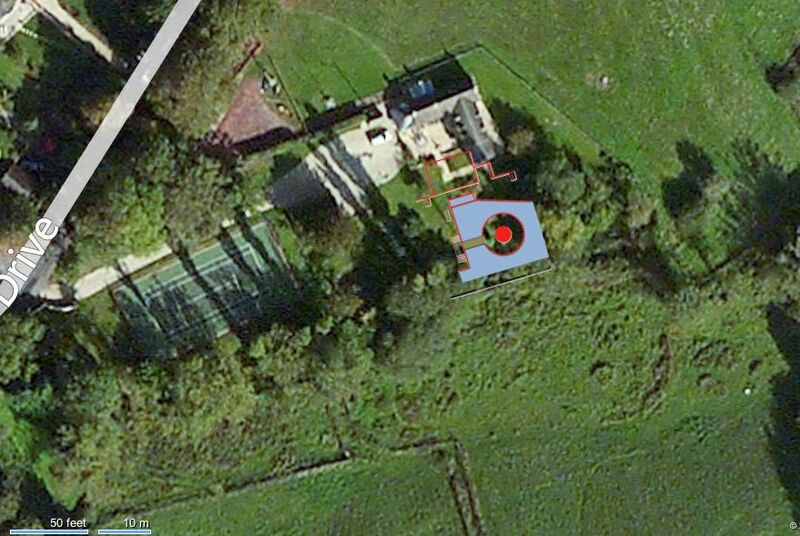 Whatever the precise location of the Marvels further investigation is likely to concentrate on detailed survey and careful examination of the gardens at water level to try and pick up traces of the walling round the island or the edging to the pool. Indeed there a stub of wall a little further to the west which could prove interesting. 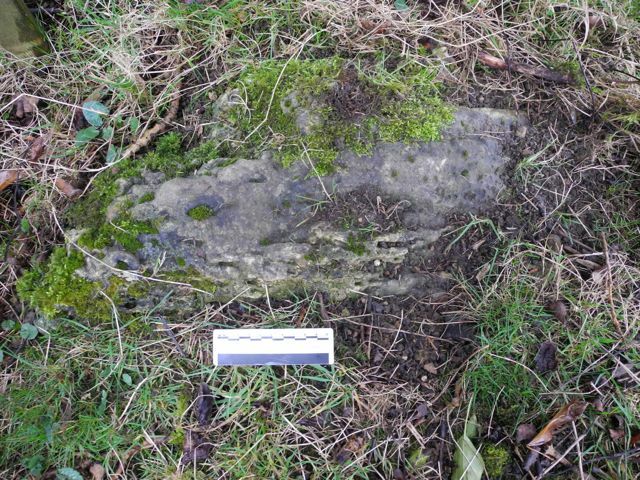 Other fragments are scattered around the immediate area all of which really need careful recording at some point in the future but for further clues about the Enstone Marvels we may need to look further afield. Walling west of garden pond looking west. Piece of calciferous stone beneath picnic bench, looking north. Triangular coping stone on wall south-east of house looking north-east. 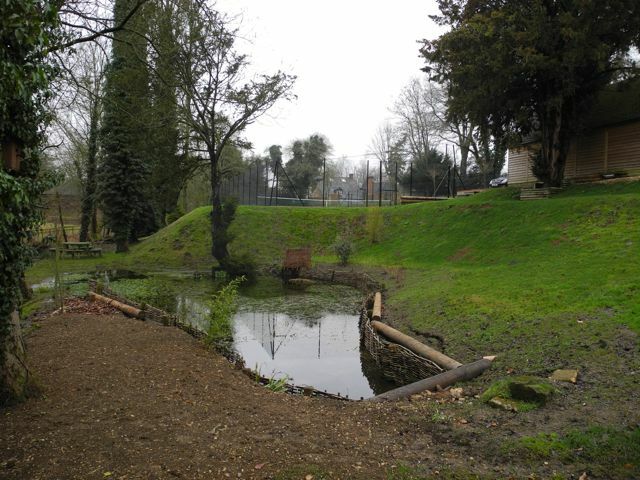 As well as features in the immediate vicinity of the grotto Bushell also had a grand house somewhere nearby and there were walks and terraces laid out around the extensive grounds. Little of this apparently remains. The field which flanks the property to the north and east does have some interesting earthworks most of which appear to be medieval ridge and furrow, relics of the open field system of cultivation, however there are other indications on the ground of some additional features that again could benefit from careful surveying. The Wells is towards the bottom left. Ridge and furrow is clearly visible running almost north south as is a possible track way which cuts obliquely across it. Ridge and furrow, view looking west. Bank to possible track way, view looking north. 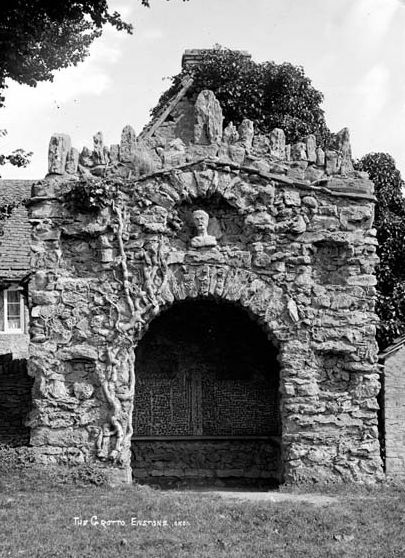 Given the scale of the demolition it would not be surprising if elements from the Marvels had been scattered round the village in the late 1840s and indeed there are a couple of notable features, however, it is important to recall that Church Enstone in particular had a number of other fine buildings, now lost, which could have contributed to these. 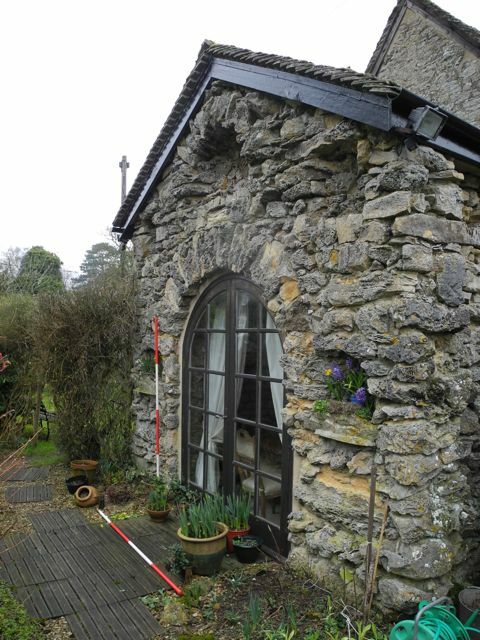 The first is found attached to end of a cottage in the village which boasts its own grotto - a remarkable and unusual addition by any standard. Today it consists of what is in effect an open ended extension to the cottage. The arched opening, now glazed is flanked by two pairs of roughly formed niches and is crowned by a fifth niche which originally accommodated a stone bust. The old post card which show this also reveals the structure to have had a coarse string course paralleling a shallow gable surmounted by a parapet made of rough stones set on end. Inside there is a modern opening into the present day cottage and the interior also has a pair of niches facing each other from the side walls. The end wall is slightly wider than the body of the grotto and so has two stub walls which protrude a few centimetres at either end. The fabric of this structure is almost entirely composed of various forms of calciferous rock in a range of crystalline forms. 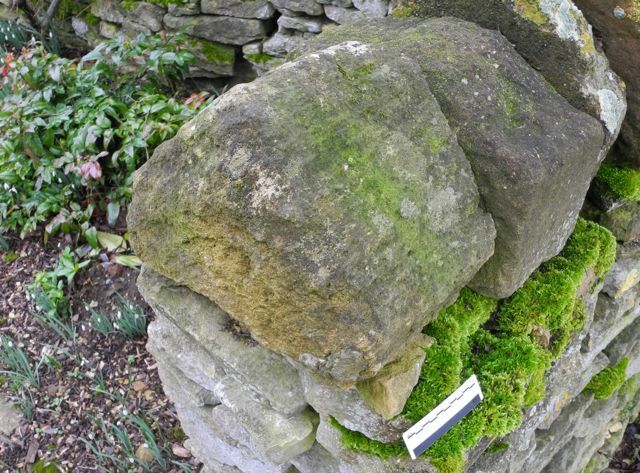 The current owner was told that the stone came from a local quarry which is certainly possible and the grotto could have been erected as a small testimony to Enstone's former fame. Alternatively the materials could have been obtained from the removal of the Marvels themselves, there are certainly questions that need looking into here. The grotto, view from south-west. An earlier view from a local postcard. Detail of the walling material. FOUNTAIN. Memorial to Eliza Marshall, died 1856. Designed by G.E. Street and carved by Earp. 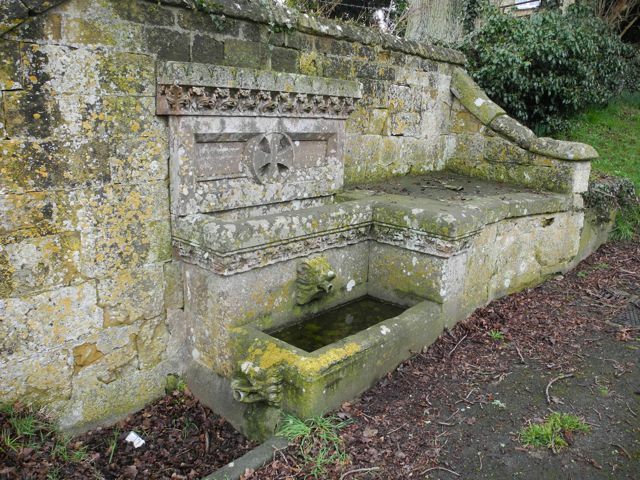 A trough with a lion's-mask spout surmounted by an inscription with a Maltese cross and a frieze of acanthus. (Sherwood and Pevsner 1974: 594). I have to say the lions had a very baroque feel to them, could they have been recycled? Whatever the case it's rather nice to see, ten years after the demolition of the Marvels someone trying to give a new fountain a special place in the village. The memorial fountain, view from south-west. 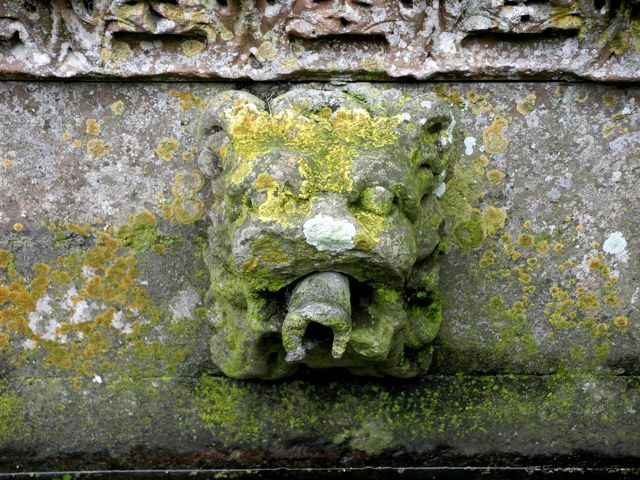 Detail of upper lion's-mask spout. Well, what a productive morning out and many many thanks to the members of the Enstone Historical Society and local residents who did so much to facilitate the visit and share their time and knowledge with me. I am sure that the Enstone Marvels will yet have the capacity to amaze and astonish us.